Wile dey aer bememberd, dey aer ownlee a thort awai. Yes, lovely. 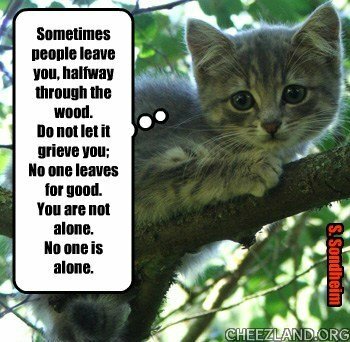 Such comforting words from a wize little kitteh. Will be seein yu, onna uver side of teh woods. And until tehn, we will make sure those of us still innit nawt be alone. We can has an awesome role model fur being loving and funny and caring. Beautiful sentiments from 2 beautiful souls. yes suite duffy, no one is alone.